Welcome back, Bangers & Mash. I’m Andy Larson, host of the 9,999th most popular comic podcast in America, Ghosts of the Stratosphere, back once again dazzle you with my comic book genius as I cross off another book from my never ending comic book read pile. This particular book was actually voted on by our Twitter fans out there about a month ago while I was on my summer vacation as one that I should read and discuss on the blog, and I’m nothing if not a true man of the people. So sure, twist my arm why don’t ya? Go ahead and make me read a Brian K. Vaughan book that Entertainment Weekly called one of the top 10 best fiction novels of the year when it was released back in 2004! I dare ya! I double dog dare ya! Why I’ll show you! Ok, let’s clarify something really quick. Unlike some of my other Ghost brethern, I am actually take the time to tell you what issues will be reviewed for the purposes of this article. I don’t just say “Yep, here’s Ex Machina, hope you figure out what books in the series I’m basing my opinion on”. I feel it gives everyone out there a frame of reference in terms of my grade and what exactly I read that helped me come up with that opinion. 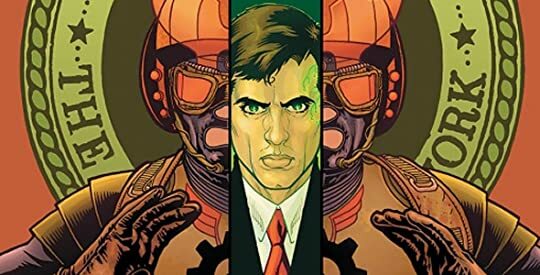 Now that my little editorial rant is out of the way, for the purposes of this article, I will be reviewing Book One of Ex Machina which if you are reading the series in single issues covers the first 11 books. Here’s a story about a man named Mitchell Hundred, who becomes the first and so far only real superhero in existence. A typical engineer until a fateful explosion of a strange alien fragment below under the Brooklyn Bridge gives him the power to mentally communicate and control machinery. As a childhood fan of DC comics, you would think that would be Mitchell’s driving force to become a superhero, but no. Turns out its a combination of that and his former communist father figure, Kremlin, who dubs him “The Great Machine”. There are stories of his early struggles trying to establish himself as a superhero, what with breaking a guy’s arm as he tries to save him from the top of speeding subway or getting a billy club in the face from the police commissioner when he was attempting to explain his “heroic” intentions. There are tales of joining forces with a NSA handler and handling some German special forces soldiers with his homemade ray gun. Most of all there are mentions of that fateful day in September of 2001 when in this fictional universe, he saved one of the 2 Twin Towers in the 9/11 attacks, despite being haunted by all those he couldn’t save as they dove out of the First Tower to their deaths. It’s pretty heroic stuff and like many books does a great job of telling the trials and tribulations of a superhero with the noblest intentions attempting to establish himself in a world that is naturally skeptical and fearful of those things different. But this is a Brian K Vaughan book, so if you think that the status quo, same old same old origin story of the Great American Hero is what he’s gonna deliver to the masses, then you are sorrily mistaken. You see all that superhero stuff I just talked about is just the backstory for the real meat and potatoes of this series, which is that Mitchell eventually runs and successfully becomes the Mayor of New York City. Yep, that’s where this series lives. A man with super powers who hangs up his boots, retires from the traditional crime fighting, and tries to protect and serve in a different way by making a difference with rational, compassionate governing. So a lot of what’s delivered in those 11 issues sees Mitchell cutting a sharp 3 piece suit instead of cape and tights, dealing with the unfolding daily crisis that plague our civil servants, from snow blizzards to questionable artistic expression with tax payer money, to hot button social issues that are ripped straight from the headlines, such as gay marriage. Mitchell is of course surrounded by a colorful cast of characters that make up his administration, such as, Dave Wylie, deputy mayor that never thought Mitchell was going to win the office and now finds himself helping sweep up messes, a no nonsense chief of staff in Candice Watts who was brought in after the first 3 all resigned from stress, and even a perky young intern named, Journal Moore, who eventually gets promoted to the position of special advisor on youth affairs. He also has Rick Bradbury, a former Marine, that used to help Mitchell as his unofficial sidekick when he was the Great Machine now serving as head of security/wing man/BFF, and I gotta say I did like their interplay throughout the series, especially given that Mitchell has like 3 or 4 assassination attempts made on him throughout the course of the first 11 issues. Man, once people know you have superpowers, regardless of what they are, they automatically start thinking you are bullet proof. Remind me not to get a completely useless superhero like “talking to sheep” or “creating Altoids out of thin air” as people would really just take pot shots at “that alien weird son of a b*tch with the minty fingers” thinking eh that guy will probably stop them. No harm, no foul, right? Also that police commissioner I mentioned before that cracked the Great Machine in the noggin with a night stick, yup, as mayor, Mitchell has to work with her, as well as number of other FBI or law enforcement officials, that either want him or don’t want him to go back to being the superhero he used to be. However, Mitchell is steadfast in his dedication that those years are behind him and he wants nothing to jeopardize his life’s calling as the Mayor of the greatest city on the face of the earth. Now it’s not entirely all city hall hi-jinx as the first story line deals with mysterious murders of snow plow operators which Mitchell is convinced is a misguided attempt by Kremlin, like some others to get him back into the hero biz. There’s also a much more interesting second story arc about the mysterious alien like fragment that gave Mitchell his ability to talk to toasters and how it might cause disastrous consequences for others that might come in contact with it, including animal mutilation and gouging ones eye out with a ball point pen. But overall, this particular book is really a wonderful series for those out there that want the experience of reading the comic medium but aren’t really a fan of all those “capes”. People like, my wife and occasional podcast guest, Nicole Larson. She often comments on how the traditional superhero books for the most part turn her off, as she likes her stories to be more grounded in realism. As someone that loved House of Cards, I know that this particular series in a no brainer for her, and would highly suggest it to anyone that loves court room, or police dramas as well. Unfortunately, for me personally, although I desperately wanted to like this book, what with the smart sophisticated dialogue and the beautiful art, in the end, it just didn’t do anything for me, and I probably won’t read the rest of the series. That’s not to say that others might not love this book, and I’m absolutely sure there are ton out there that will, it’s just I could care less about the subject matter. I mentioned previously those that might have loved House of Cards, or the West Wing, would love this book; me, one the other hand, I never liked either of those shows. In fact, I pretty much hated them. I’m more of an escapism guy, I like science fiction and fantasy and things that can make me forget about real life for a little while. If I wanted to hear the struggles of city government and the internal drama of those who serve, whether that’s as fire fighters, or police men, or mayors, then I’d watch the news or a real life documentary on the subject, not watch a TV drama or more importantly read a comic book. This is why I found myself half reading/skimming most of the city hall type pages of this book and skipping ahead to all of flashbacks of the Great Machine, or that more X-files style story about the weird alien glyph making people go crazy on the subway. Long story short, I think I’ll stick to Saga for my BKV fix as it’s just more of my kind of entertainment subject overall. However, I would still highly recommend that everyone give this particular series a whirl. Regardless of whether I liked the overall subject material or not, it was expertly written and I can’t fault it for that. At the end of the day, it just comes down to that age old cliche that rings so true here: Ex Machina just wasn’t for me.